Today is the day for The Secret Recipe Club Reveal. This month I was assigned The Colbert Clan written by Kate. Kate is a wife and stay at home mom to three beautiful kids. She not only shares recipes on her blog, but DIY projects as well. Kate is also a Fitness Coach for 21 Day Fix/Shakeology and shares recipes that work with the exercise program. One of the things I love about the Secret Recipe Club is that it gives me the opportunity to thoroughly go through a blog and discover lots of different recipes. After going through Kate's blog, I decided to make her recipe for Mini Omelettes. I liked the idea of baking a bunch of omelettes at once and then reheating them when you want to eat one. I loved to eat them sandwiched in a toasted English Muffin. It makes a quick breakfast when you already have them baked and in the fridge. You can reheat them for 30 seconds in the microwave and they are read to enjoy! I halved Kate's recipe and got 6 mini omelettes. They are very versatile so you can change up your add-ins. I used green onion, red pepper, garlic sauce and Parmesan. Some of Kate's other recipes that I am looking forward to trying are White Chicken Enchiladas, Breaded Cauliflower and Frozen Hot Chocolate. Please head over to The Colbert Clan to see more of Kate's great recipes! Scroll to the bottom of this post to see what everyone else made for today Secret Recipe Club Reveal. Preheat oven to 350 F. Spray a muffin tin with baking spray. In a small bowl, whisk the eggs. Add remaining ingredients and whisk together. Pour into prepared muffin tin. Bake 20-25 minutes. I love these! I have thought about doing something like this many times to have a quick, filling, protein packed breakfast but haven't taken the time to. Yours look fantastic. That looks so easy and tasty! What a fantastic idea! I'm definitely trying this. 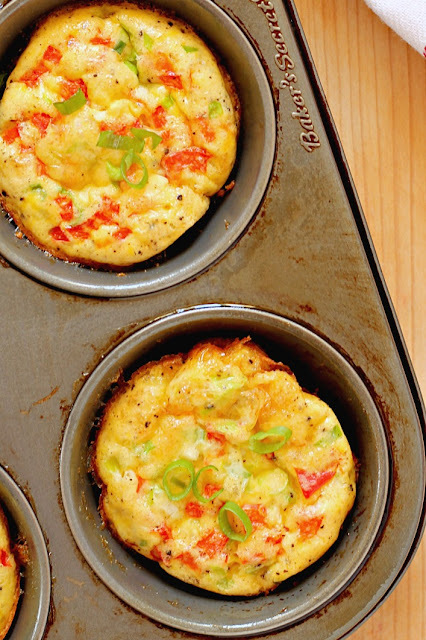 That a wonderful idea to bake omelettes in a muffin tray. These are so neat! I never would have thought to make single serve omelets - the perfect breakfast! I have a weakness for all things mini. These are so cute and sound delicious! What a great idea for a Holiday breakfast or brunch. Thanks so much for sharing. Great pick this month. Love how easy these are and the idea that they can be pre-,made and reheated is making this dish more and more delicious :). Sharing immediately. I make something similar for quick breakfasts on the go -- i customize them so there's some that I love, some that my husband loves, some that my daughter loves. Win, win! =) Yours look great. I definitely do not use my muffin pan to it's full potential. What a great recipe for weekdays! What a great way to make omelets, and i love the mini versions. Great idea of making mini omelette.!! Thanks for sharing this idea and recipe. !